← What we’re reading: Stick insects, Gulf of Mexico oysters, and how many peer reviewers it takes to change a lightbulb joke? Medicago truncatula in its not-very-natural habitat, the greenhouse. One of the most obvious and important applications of evolutionary genetics is in figuring out whether natural biological communities are going to be able to adapt to global climate change. The projected rate of climate change over then next century is unprecedented in the evolutionary history of most living things, and we need methods to rapidly assess the genetic capacity of natural and cultivated populations to evolve in response to warming. Genome scans for loci that are locally adapted to climate provide one tool for that assessment. Unlike traditional quantitative genetics methods, a genome scan doesn’t require cultivating the species of interest in controlled conditions. Instead, genome-wide marker data from a sample of natural populations can be used to find genome regions that are probably important for adaptation to climate, and these can be assayed for variation in populations threatened by changing conditions. 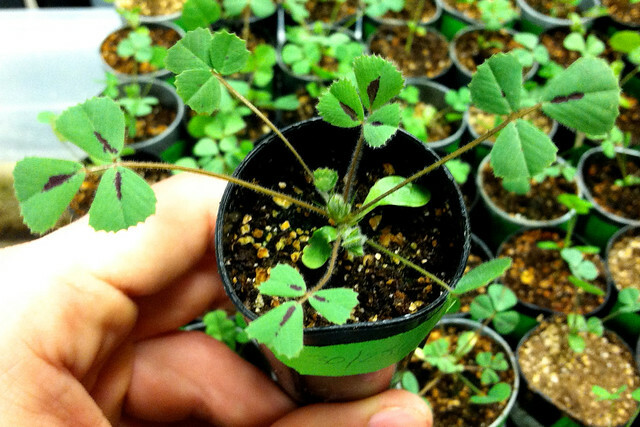 The Medicago Hapmap Project has assembled a panel of 288 selfing inbred lines of Medicago truncatula, and aligned Illumina DNA sequence data from each plant line to the M. truncatula reference genome. Depending on how that data is filtered, it identifies upwards of 6 million single-nucleotide polymorphisms (SNPs)—more than one SNP every hundred base pairs along the whole length of the 500 million-base-pair reference genome. The sites of collection for plant lines in the HapMap panel (black points), with locations shaded by annual mean temperature, in ºC*10. Figure 1 from Yoder et al. (2014). I dug into the information we had on every plant line in the HapMap panel, and with a little additional detective work, I worked out the latitude and longitude of the locations where 202 of the lines were originally collected. I used functions available in the dismo package for R to query the Bioclim climate database for temperature and precipitation conditions at all of those locations. And then I used that climate data like the phenotypes in a genome-wide association study. That is to say, I used the method implemented in TASSEL to identify SNPs that showed strong association to temperature or precipitation at the sites of collection—SNPs for which, say, the annual mean temperature at collection sites for plant lines with one allele was strongly different from the annual mean temperature at collection sites for plant lines with the alternative allele. Conceptually, this may seem a little bit odd, because the climate at the site where a plant line was collected isn’t really a trait of that plant line. It works, though, if we accept the assumption that the climate variation across the natural range of M. truncatula is a significant source of natural selection, and that some unmeasured traits of the plant mediate local adaptation in response to that selection. Setting things up this way worked well for the manner in which the HapMap plant lines are distributed across the landscape, with every plant line treated as a separate observation, rather than grouped into populations. It also let me take advantage of the fact that TASSEL estimates association strength using a mixed linear model which can take a matrix of genetic distances as a co-variate—this can help to control possible conflation of local adaptation and isolation-by-distance. I used this method to identify the SNPs with strongest association to annual mean temperature (AMT), precipitation in the wettest month (PWM), and isothermality (ITH; a measure of temperature variability). Somewhat encouragingly, many of these turned out to lie in genes with sequences similar to genes involved in drought and heat tolerance, regulation of stomata, and release of winter dormancy in other plant species. Regression of growth rate in hot, wet conditions on number of “high” alleles for AMT (red), PWM (blue), and both (purple). Supplementary Figure 9 from Yoder et al. (2014). Finally, I looked at patterns of sequence diversity near the candidate SNPs, and compared them to the genome as a whole. Compared to the rest of the genome, regions containing candidates for AMT and PWM showed increased differentiation between the alternate alleles of each SNP, as indicated by elevated FST, and reduced haplotype diversity, as indicated by elevated H12. 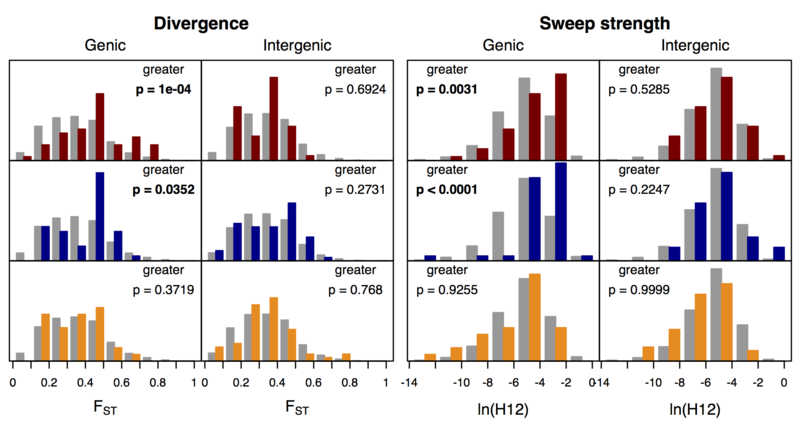 This differentiation from the rest of the genome was apparent in candidate SNPs lying in gene-coding regions, but not for those in non-coding regions. Those patterns are consistent with a history of local adaptation acting on the genome regions identified by the association scan. But, with that caveat, I hope this work helps improve our understanding of the population genomic patterns we should be looking for as we study—and try to preserve—natural populations responding to the biggest environmental experiment in human history. Li YF, JC Costello, AK Holloway, and MW Hahn, 2008. “Reverse ecology” and the power of population genomics. Evolution. 62: 2984–2994. doi: 10.1111/j.1558-5646.2008.00486.x. Yoder JB, J Stanton-Geddes, P Zhou, R Briskine, ND Young, and P Tiffin. 2014. Genomic signature of local adaptation to climate in Medicago truncatula. Genetics. 196:1263-75. doi: 10.1534/genetics.113.159319. This entry was posted in adaptation, association genetics, genomics, next generation sequencing and tagged Medicago truncatula, mixed linear model, TASSEL. Bookmark the permalink.